One of the movies of the century! I must admit, I don't really like this movie (I know, I know). I find all the characters despicable and it's hard for me to sit through the 3+ hours of abusive and manipulative relationships. 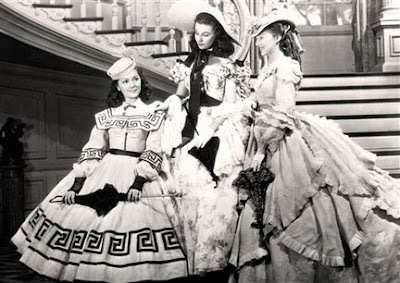 BUT I do love the scenery and costumes and I love seeing how this movie influenced fashion in both 1939 but also into 1940. McCall 3559: This evening dress has a corset-like bodice and an extended hipline. Sewn inside are "hip-rounders," pieces of crinoline, doubled and pleated. 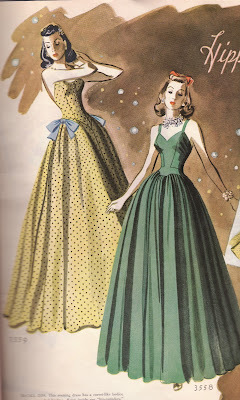 They, plus the gathers, plus the bows, do much to make the waistline seem smaller. McCall 3558: The ultra fashionables are making their hips swell out in order to make their waistlines cave in. So they are wearing hip pads. (Of course the dress can be worn without them.) The fulness at the bosom helps on this hour-glass effect. 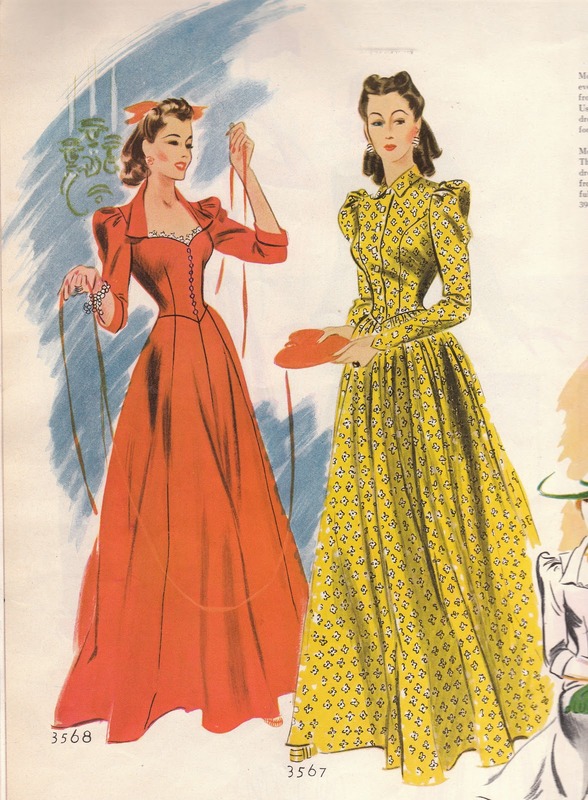 In the description it says McCall 3567 has hip pads as well but they seem much more subtle (at least from the drawing above). So much fun! What do you think? Did you like the movie? 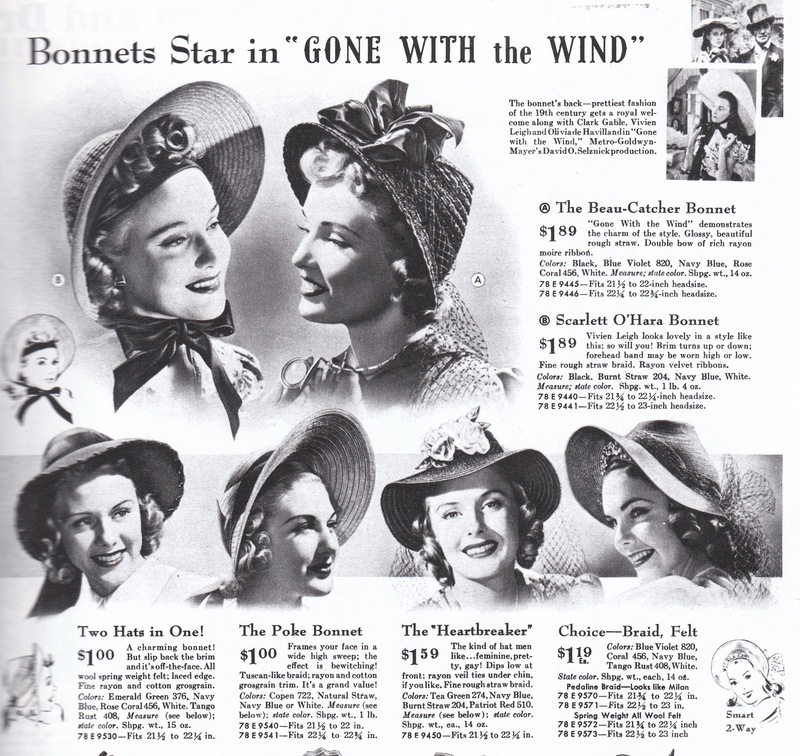 Would you wear one of these bonnets? What about the hip pads? Ooh lurrrvely! I only saw this movie for the first time about five years ago. I saw it in the cinema with my boyfriend and I didn't realise how long it was - I thought the intermission was the end! Since then I watch this as a decadent treat whenever I come to the end of a big task (eg. MA dissertation, big work project...). Costumey drama aside, I can see how a hip pad might be beneficial to making the waist look smaller. I don't think I'LL be adding any more padding to these hips, but you never know! And you did a whole post on GWTW without mentioning CORSETS!! Fiddle-dee-dee!! I wonder if there was a resurgence of corset-wearing after the movie? 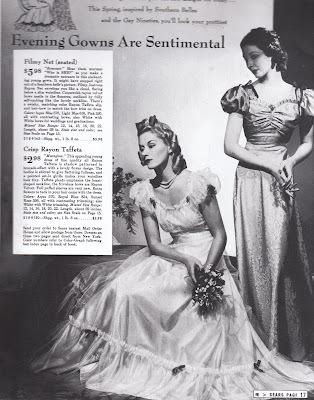 Corsets were out of vogue by 1939, right? 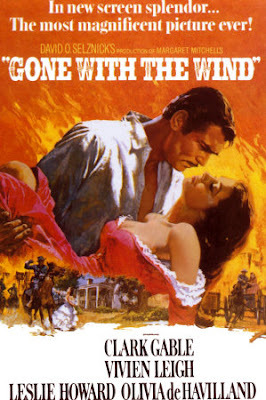 I love Gone with the Wind! I used to think mealy mouthed Melanie was a boring prude, but now I see her as a very strong and capable woman, though I would never wear one of those bonnets. But I would put Scarlet's wide brimmed cartwheel hat to immediate use. That hat is perfect. Oh, and hip pads? My favorite crinoline has "hip rounders" under the outer layer of tulle. The effect when worn is very flattering. A premonition of Dior's New Look? To be saved in a back pocket until after the war. I love the first two ball gowns! I haven't seen this in so long and I have never been able to get through the book. It is absolutely beautiful though. And I think Vivien Leigh is gorgeous. Ha! This was the first mega-novel I fell in love with (which I read when I was 13). 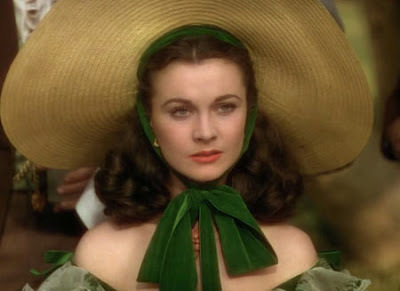 I also forgave the film a lot of faults because I was so in love with the novel -- and I can't help but think of Scarlett's 16-inch waist (or the ridiculous ring Rhett Butler bought her when I think of faux cocktail rings) whenever I think of Gone with the Wind. It's definitely a wistful reminder of a bygone time. Saucy women, naughty men, war, privilege, loss. Her costumes reflect the changing times, too. Thanks for the reminder! What a fascinating post! I love Gone with the Wind. Actually bought myself 2 FQs of Gone with the Wind fabric last week to make a bag for my friends christmas... Cant beat it for full out and out drama! I feel similar to Ali, I read it in grade 6 for a book review project and I remember thinking it was the biggest book that I had ever read. I love the film and I feel it has many strong female characters (Melanie, Mammie and Scarlett). I know many people hate Scarlett but I feel she is just a really strong woman, she didn't need a man, she just wanted one. She did what she had to do to get ahead in life. I didn't see GWTW until I was an adult, but didn't really like it too much. It was another one of those "epic" movies where I adored the costumes, but the plotline and characters kind of left me "meh" (much like Titanic! ;). I do love looking through fashions from around the time the movie came out and spotting influences! 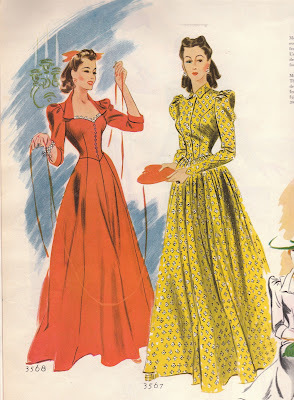 It's really fun to see the neo-Victorian look that was popular then; especially since it was a short-lived trend due to the wartime shortages that started affecting the fashion industry. I'm with you Debi, I don't like the movie. Scarlett is missing too much of the lovely feminine character even if she does dress lovely. Her beauty was all external, and she didn't take care to cultivate her character. I love bonnets! Alas, every time I put a hat on that I think is cute, my sister thinks it looks strange! :D Ah well. I can still dream. Hip pads? I, personally, can't imagine using them, but I can see why they would be used. 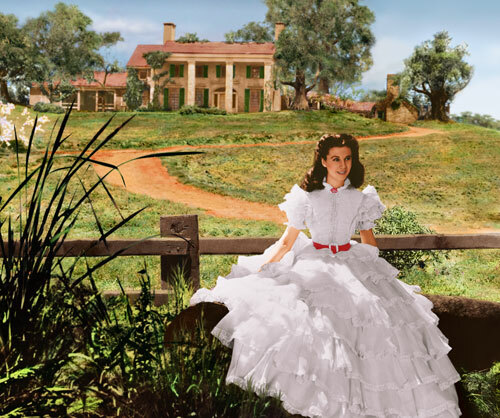 Oh my goodness, I love GWTW so passionately that I'm floored when others don't! But there are many other reasons to love the film and the sartorial stands as the most prominent. McCall 3567 and 3568 were definitely patterned after this movie, I believe I've seen them in a book on the marketing of the film. They're patterned after Scarlett's red "adulteress" dress and the dress she wears when she returns to Tara after the Yankees have pulled out and she gives her thrilling "As God as my witness" speech. I have a lovely straw sun hat that I bought this year specifically because it resembled the one in the film. Also, this film gave rise to the popularity of snoods during this time. I like the movie - but it is not one of my top 10 or anything...of course it is such a costume delight. As for hip pads - totally! - anything that gives the illusion of a smaller waist is fine by me! eureka! this must mean that a 40s dress I have in my shop is earlier than i thought. This makes complete sense---I imagine WWII and the CC41 put an abrupt stop to this fashion until after the war in the UK at least? Interesting how such styles seem to have gotten taken up again after the war ended? Great post! My family recently watched it, although I only had time to see the first half. I know I liked watching it as a very little kid. I can't stand Vivian Leigh's character but Clark Gable makes it worth watching! I just renter It Happened One Night and he was just as devilishly handsome. Great scans, by the way! And I would wear every one of these. I loved this movie! I read the book when I was really young, like twelve, and I thought Scarlett was so cool. Now I'm older and see it from a totally different perspective, but I still love her dresses! That green and white one is so lovely. If I had a reason to, I'd totally wear a dress like hers! 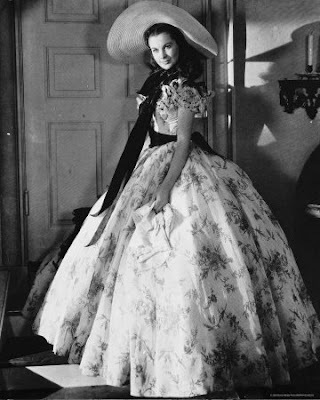 I'm with you on GWTW; great costumes, lovely scenery, boring movie. After hearing it being raved about for years I was rather let down when I finally watched it. Hip pads - not really needed here! Love the bonnets even if I have no where to wear one. Wow - reading everyone's comments really brought this all back to me. Scarlett's character is supposed to be someone you can dislike: She's spoiled; she's Daddy's girl, she's used to being the belle of every ball. 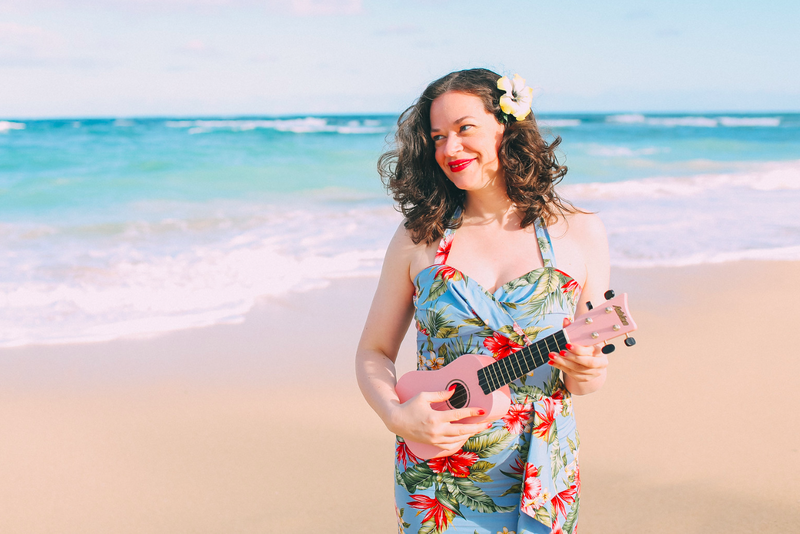 She has her whole future mapped out for herself, in tune with the culture and pattern of the time: Marry the most handsome, most rich planter's son she can get to marry her and then retire to a life of more luxury and parties. 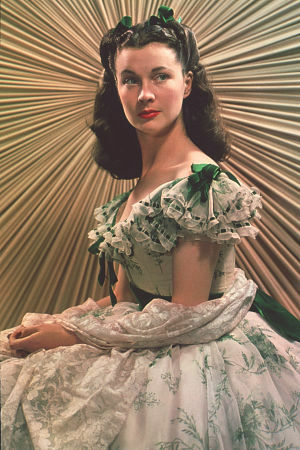 Margaret Mitchell was, in her own way, trying to send a very strong message about what happened to those women, who were (remember when she was born) people she actually knew and had in her family. What happened to them was that their whole life/culture was literally 'gone with the wind' - the war changed everything. Women who had been brought up to be protected and cherished and coddled like toys had to woman up and save what they could when everything was destroyed. Scarlett's mother was the woman of the plantation - she was the manager and made sure everyone had clothing and food -- remember, she was the one who got her husband to fire the overseer. Scarlett had to go from this doll like existence to basically doing whatever she could do to survive. And if that meant marrying people who she did not love, then she did that. Mitchell was from Georgia - she was writing this story in the 30s when she been able to interview people who had been young people at that time who were still around to tell her. You could actually put that story into WWI or WWII and do the same thing - this story is about what war does to people who are unprepared for life in the outside world. There are people who survive and people who thrive. And frankly, the people who thrive under war conditions are not nice people. If they were nice to start with, they stop being nice. I think that unless you go through some very difficult life altering things, Scarlett seems very one dimensional and a caricature of what a woman is like. While she is still pretty one dimensional even then, her motives and the demons that drive her are recognizable to those that have a similar path. Or as Toby pointed out, hardships (in this case war) creates those that simply survive it and those that thrive. I don't dislike the movie or the book, but they are not my favorites either. I see too much of myself in Scarlett to enjoy it fully. I am glad to see that I am not the only one who dislikes this movie. I watched it for the first time last month and the characters made me want to scream! But the costumes, ooh the costumes! 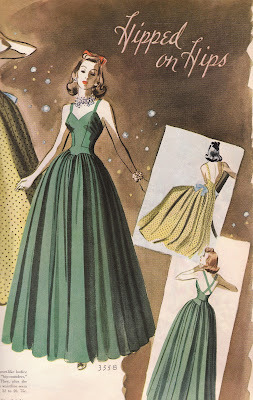 My favorite is the green velvet dress that she makes out of the curtains! I love the one fitted sleeve and the one drapey sleeve! I will happily admit that I love the movie, but I can not get my husband to watch it for love nor money. And I love you post - the costumes in the movie are great but I had no idea that they inspired fashion of the time so much.